I love making crafts from my children’s artwork, and we have plenty of artwork around our house from which to gather inspiration. 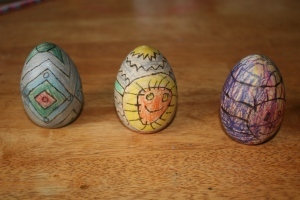 Last year we had three wooden eggs in our stash of art and craft supplies, and I thought that was perfect for my three older kids as we prepared for Ostara. When I proposed the idea, the kids were thoroughly enthusiastic. The first step involved pencil and paper. The kids drew various designs that they thought they might like on their eggs. After they were finished, I took various drawings they had made, transferred them to the wooden eggs, and woodburned the pencil marks. For a really polished and professional look, I would have colored them myself. However, I wanted the kids to have their own eggs, so I handed the newly woodbunred eggs back to them to color as they saw fit. My eight-year-old had gone with geometric designs, and I was easily able to incorporate them together. I had imagined his egg with brighter colors, but he chose the subdued colors he prefers (minus his lifelong favorite — orange) and it really does scream him. My six-year-old daughter wanted spring ideas, as she said she was ready for spring to be here and winter to be over. I think she accomplished that with her sun drawing. The other side of the egg has a butterfly. I love her simple-shape butterflies. Some of her other drawings included eggs with zigzags and stripes, so I transferred those in between her spring drawings. She loved it. My three-and-a-half-year-old had a happy face and a rainbow. He also had a horse that he had his sister help him with. Since I wanted it to be his egg, I declined putting someone else’s drawing on it. I reminded myself of this later as I saw the way he colored his egg — totally different than his carefully constructed rainbow on his paper. He was so pleased with it, though, and it will always remind me of how he was at this age, alternating between sage beyond his years and an impulsive little boy. 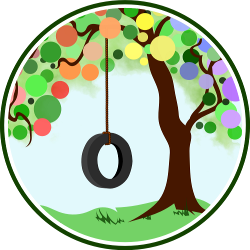 This post was rewritten from one previously posted at Living Peacefully with Children. this would be fun to do with my niece and nephews! Could keep them from year to year and see how creative they become.